Easter celebrations range from commercial to Christian and include people of all ages. Writing or reciting a speech about Easter can help children better understand what they are celebrating. The speeches below are original, written by the author Michele Meleen. The final two speeches are original and written by Tamsen Butler. To open the printable, click on the image. If you have issues, see this guide for working with Adobe printables. 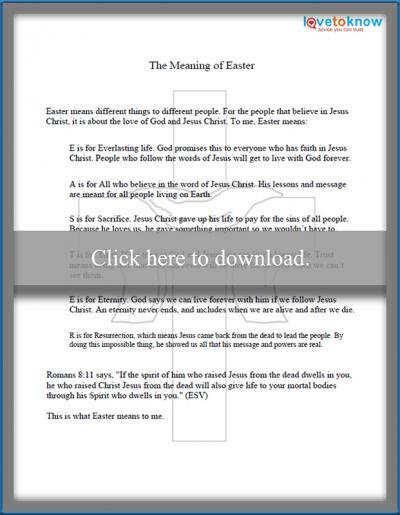 This short Easter speech for youth uses a more traditional format to explain why people of all faiths and beliefs enjoy celebrating the holiday. Extraordinary Easter is appropriate for a nonreligious celebration. Kids of any age can use this easy Easter speech as it is written or as inspiration for their unique version. Toddlers and Preschoolers can dress in costumes matching each bullet point and stand with an older speaker. You can have one child read the speech or if you have a group of children, each child can read or recite one part. Older children might research more Easter symbols and add them as bullet points. Kids can customize Extraordinary Easter by substituting in other symbolic items or creating new closing lines. Children can recite this Christian acrostic poem to explain why people celebrate Easter. The Meaning of Easter is appropriate for children of all ages but may be best understood by those who are five and up. Children reading this speech could hold a Bible, or dress as a disciple for added effect. It is a good option for an Easter speech for church, and can be combined with other Easter recitations. Keep the original base words (Everlasting, All, Sacrifice, etc.) but reword each sentence to fit their vocabulary. Use the format with the word EASTER and come up with new words for each letter. Use the same format, but eliminate the Christian tone by choosing more commercial words like eggs or treats. 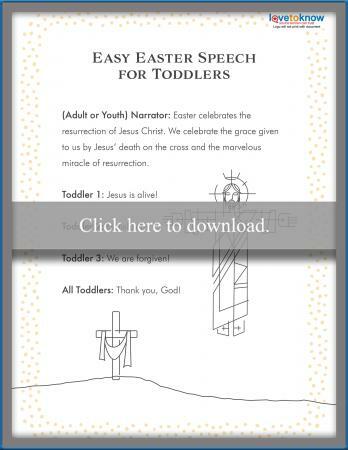 Keeping it short and sweet is the key to successfully presenting a Christian Easter group speech with little ones. This speech features an adult or youth narrator followed by short, easily memorizable lines for the toddlers. 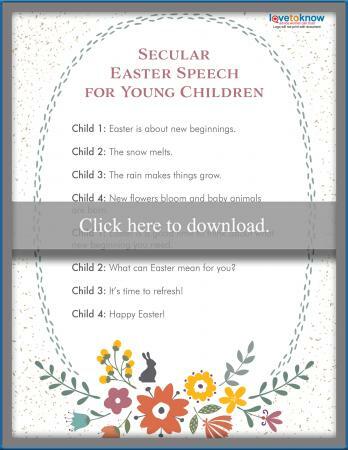 If you want young ones to present an easy Easter speech but prefer to keep religion out of it, this secular group speech focuses on the renewal of spring. Christ's Resurrection - When told from a child's understanding, a speech about Christ rising to walk again can be enlightening. Jesus' Love - Children can think about topics like how they know Jesus loves them. Grace - Speeches could explore what the word "grace" means to Christians. God's Sacrifice - Children could refer to God's sacrifice by presenting a comparison to the love their parents have for them. The Cross - Talk about the starting point for what the Christian symbols of Easter mean. Easter Bunny - Explore where this symbol for Easter came from and what is so special about him. What message is the Easter Bunny trying to send? 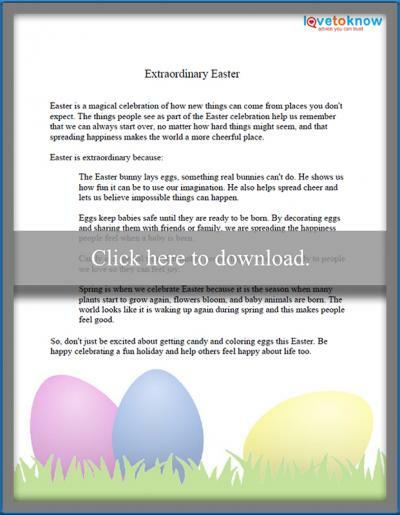 Spring - Kids can learn about why people celebrate Easter in the spring and what meaning the season adds to the holiday. History of Easter - Digging through resources will be educational and help kids understand why they are celebrating. Multicultural Customs - Children can explore if and how people celebrate Easter in other countries or cultures. Are there any similarities? Easter Feasts - There are many specific foods associated with Easter celebrations. A speech about the significance of these foods could be used before the meal. Symbolism - What is a symbol and why is it important? Kids can look at what each Easter symbol means to them. Help children express their take on Easter celebrations by asking what Easter means to them. 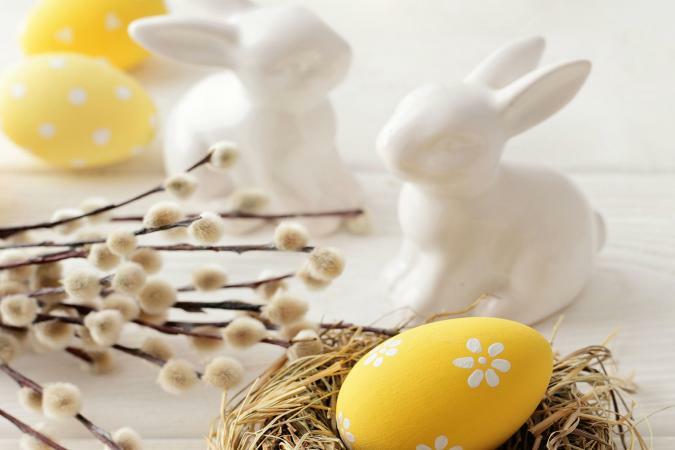 Reciting a speech about Easter can help kids learn more about why they are celebrating this spring holiday.